One of the 3 Trimin is offered for sale! Robert, the owner of what I suppose to be one of the 3 Trimin, is selling his car. You'll find everything about it by clicking on the link below. Rob is opened to offers. If interested, please let me know. It's a rare opportunity to get a Mosquito. 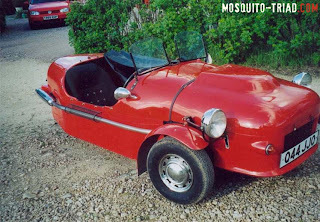 Remember that only 24 Mosquitos / Triads were built and only 4 with this shape. Don't miss it! You can get in touch with Robert by email.